If you’re having difficulty setting default file associations using the dism import method then you can try the following alternative. I’ve updated the script I use to Powershell. Process is the same though. Be aware that a lot of people have reported difficulty in setting file association defaults with them reverting back to their defaults at first login. This seems to be related to an update that was included in the April/May Windows 10 Cumulative Update. There is no fix presently that I’m aware of however some have had the issue and some do not which makes me think its related to the application itself and how its modifying the Windows 10 default file type settings. Hopefully this will either be addressed by developers releasing updated versions of their applications that conform with Microsoft’s expectations or Microsoft releasing an update to address the issue. With Windows 10 now approaching its 2 month anniversary since RTM, I have finally finished the reference image our agency is going to use. Its taken quite a few attempts to get things right so hopefully some of my approaches to implementing solutions to some common issues will save you some time and effort. Firstly lets establish how I’m creating my reference image. I’m using two Hyper V Virtual Machines running on a solid state drive. Then running a pretty standard Build and Capture task sequence with LTISuspend.wsf to allow for some minor changes. With that out of the way – lets talk about how I’m setting my default file associations. By default Windows 10 has a number of default associations which you may not wish to keep. For example, by default the PDF extension is associated with Microsoft Edge so if your deploying a 3rd party PDF reader, you’re most likely going to want to deal with this. Some other file types you may want to change may include what application is associated with photos and videos as by default these are associated with the built in modern applications. You may also want to change the default browser from Edge to Internet Explorer 11. 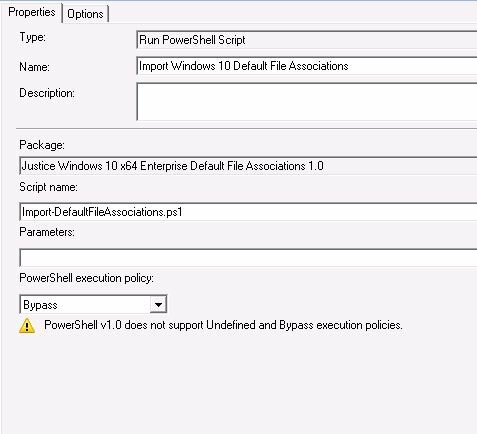 You can control file type associations with group policy and there are quite a few blogs already about this. I’ve chosen not to use this approach as it enforces a baseline set of associations and I want my environment to be flexible to allow for variation if needed. On a reference computer running Windows 10, install all of your standard operating environment applications then set your default programs as per your preference. 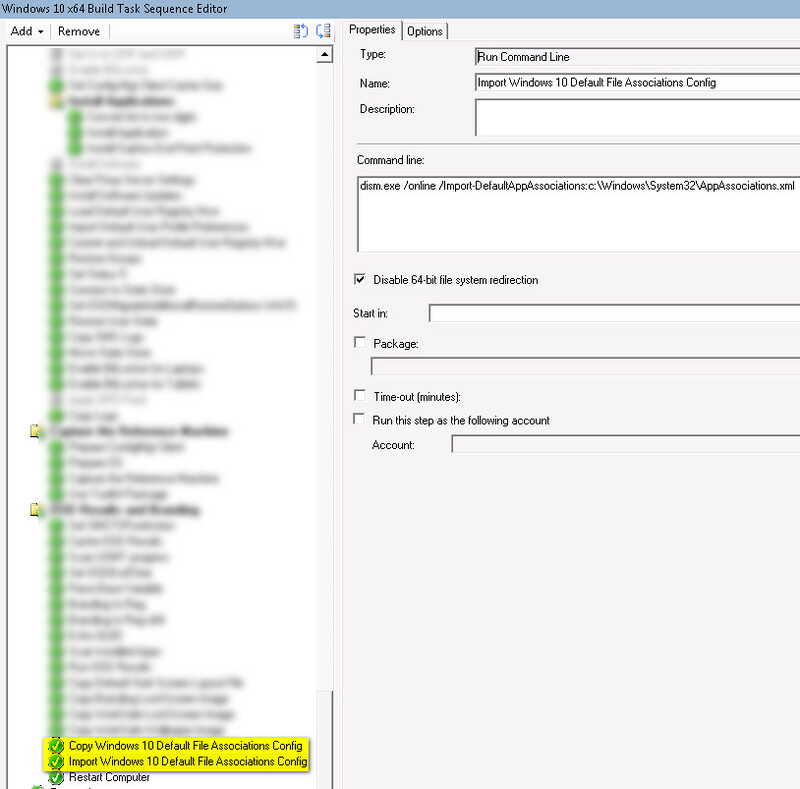 Next create a new Configuration Manager package that includes this xml file and distribute it to your DP’s. You can edit the file if you need to make further changes. Note that you don’t need to create a program. Now we need to create two new Run Command Line steps in our Windows 10 Configuration Manager Task Sequence. 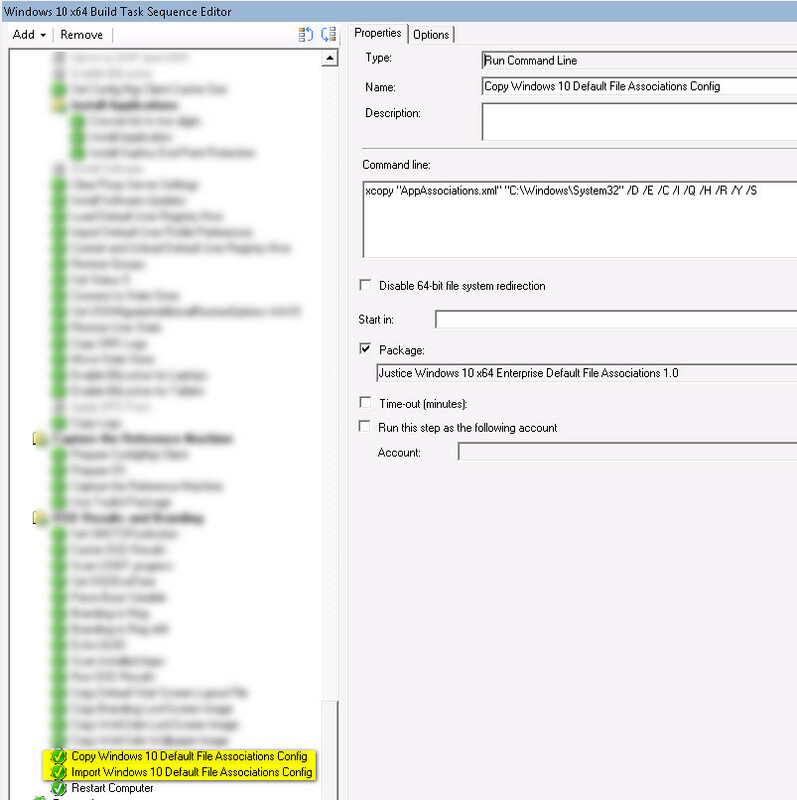 One to copy the xml file locally to the target workstation and a second to execute the DISM import command. I’ve added these steps to my OSD Results and Branding group section of my Task Sequence. Make sure you disable 64-bit file system redirection otherwise your DISM import command will error out. That’s it! You will now have a reference image that has a default set of file type application associations.